The commercial district revitalization process applies to areas where multiple property owners and their tenants weave a complex web. Such business areas pose many challenges when compared to single-owner enclosed malls or strip malls. Multi-owner districts, including downtowns, generally exhibit an upward or downward trend in vitality, occupancy, appearance, and adaptation to current shopper preferences. These days good intentions do not create upward spirals automatically, so this page describes seven keys to commercial district revitalization. Each is important, so scan through. We are not implying that every business district needs this level of intervention, but when a geographic concentration of businesses feels itself in need of regeneration, these action steps are essential. Many states in the U.S. allow the creation of a legal entity called the business improvement district, which also might be called a special business district or community improvement district. Similar mechanisms are in place in many other nations. These entities may have power to impose special real estate taxes, sales taxes, assessments, or all of the above, for the benefit of special projects or services in the district. Beautification, seasonal plantings, trash collection, and extra security are especially common agendas for these districts. In the majority of cases it will be advantageous to form such a district to support commercial district revitalization. If substantial property or business owner objection appears, you may want to wait to build more consensus for the formal district, but it is a worthy goal. Many municipalities simply cannot afford the level of service that a particular business district needs, and the property and business owners or patrons deserve the opportunity to support a higher level of service financially. Especially if there is no worthwhile business improvement mechanism in your state, you may want to opt for an informal approach, such as a local business association that funds special projects through dues or fundraising, and then oversees implementation. The local business association is less successful in nudging uncooperative building or business owners forward, but if almost everyone is on board, the association approach can be successful. Such a business association should incorporate, probably as a non-profit. We notice that both a special taxing district and a business association are active in many locales. As long as duties, responsibilities, and areas of interest are clearly delineated, this may be worthwhile. Of course the negative side is that maintaining both takes substantial energy and time on the part of business owners, and it is possible that conflicting agendas might develop. We also should comment that in the U.S., many historic downtowns are participating in a Main Street program. We heartily endorse their approach, but just prefer the slightly more generic language we will be using on this page. If you have a Main Street organization, keep on working within that fine structure; for areas other than downtowns especially, our outline may be more appropriate. In almost all cases a manager is needed for commercial district revitalization success. Occasionally this role is filled by a city or chamber of commerce employee who has a few other responsibilities, but who is able to devote major chunks of time to supporting and leading the district. Very rarely a volunteer or business owner who employs a manager for his or her own business may be able to devote the requisite time and attention to the task. The manager chosen should have skill and experience in at least one or two of the three major tasks facing your district. He or she might be a marketing genius, urban planner, or retired serial business owner. Most recent graduates and housewives or househusbands will not have the necessary skills and will not be able to stand up to competing loud voices among those who have been active in the area. Property owners should, can, and do recruit their own tenants, but targeted recruiting on behalf of the district means building the identity of your area by finding a specific missing business type, such as a pharmacy, dry cleaner, bank, bakery, inexpensive lunch restaurant, and so forth. 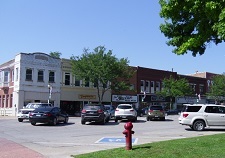 Some districts, especially downtowns of small towns or cities, may aspire to meet all everyday shopping needs of residents, but that diversity too will need to be carefully curated. Districts wanting to develop a specific identity (such as upscale, college town, foodie, young family-friendly, or what you) should target specific missing components of the mix as well. In many cases commercial district revitalization project leaders frown on national chain stores. If the district's character leans toward small, quirky, and local, it is worth exploring formal and informal ways to avoid chains. If your strategy is to support local business, scan local businesses in nearby towns, suburbs, or shopping districts to find someone who might appreciate a second or third outlet in your particular district. Then visit that business personally, and keep befriending the owner till he or she sees why your district is so great. In this activity, it is incredibly important to enlist the cooperation of building owners first and foremost. Help them understand the vision and the rationale behind your specific recruitment. Also it is critical not to expend effort on unrealistic recruitment. If a targeted business tells you there is insufficient market for their goods or services in your area, consider that argument carefully. If your rationale still looks good, let rejection propel you to the next potential business. If you appreciate their point though, recalibrate your attention to something more realistic. 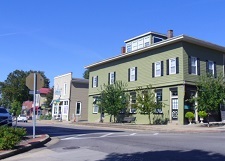 If buildings in the district comprise a particular architecture style, care must be taken to assure that any infill new construction is sympathetic with the style, that facade renovations and building additions complement the feel of existing buildings, and that preservation of distinctive details is assured as buildings are rehabbed. Notice that we did not say you have to replicate existing buildings; small variations and bursts of creativity are pleasing. To enforce a design theme, you may find it necessary to craft local design guidelines. Where architecture is undistinguished and hodgepodge, thought should be devoted to how to add some character, either as new buildings are constructed or through a renovation program that might add, for example, characteristic awnings. When architecture is bland, new streetscape may be needed to give the district personality. A strong pattern of pavers, flower boxes or planters, street trees, or street furniture can distract the eye from bad or inconsistent architecture or building materials. Boring architecture is also a good reason for a strong, tasteful sign regulations allowing a tight palette of acceptable options. All the wonderful architecture enhancements and streetscape in the world will be wasted if buildings, streets, and the public space between the street and the building line are not clean and well-maintained. Litter must be picked up regularly, and trash cans need to be emptied when full. Experiment to determine the specific interval needed. Some districts must have sidewalks and parking lots swept daily, whereas others where there is less littering may be able to employ a once or twice weekly sweep. Occasionally business owners can handle cleanup on their own, but often it is necessary for the district to employ a person or service specifically for this reason. Likewise maintenance of sidewalks, paths, street furniture, plantings, any public restrooms, and street lighting is essential. Set a high standard for maintenance and cleaning. While these activities do not automatically lead to commercial district revitalization, certainly their absence detracts from a wealth of positive activity. Regular preventive maintenance of your tree canopy deserves special mention here. Trees soften the rectangular shapes of buildings, add a pleasant bit of informality and unpredictability to your landscape, and provide shade, which leads us right into our next topic. Ideally, the purpose of commercial district streets is to serve shoppers and to convert any "through" traffic to shopping traffic. In the real world, sometimes the design of the city makes it impractical to eliminate the through traffic function altogether, but the city must plan to prioritize pedestrians to make a business district successful. Fast traffic through a commercial district certainly should be avoided. Cars moving at 35 or 40 miles per hour are dangerous to pedestrians, and cities should take extreme action to avoid those speeds. If an arterial street currently divides a business district, traffic calming measures are in order. An easy measure is to add on-street parking to narrow four lanes down to two. If you have only two lanes of traffic already and people are still speeding along at a pace uncomfortable for pedestrians, you can try lowering speed limits enforced for the first several months with a friendly, novel, and informative warning brochure. 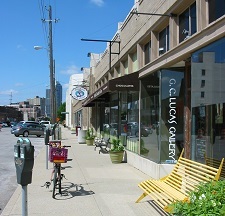 Of course don't overlook the potential traffic calming impact of great-looking storefronts or stunning public art! Although fashionable in some decades to establish one-way street pairs through downtowns in an effort to move more traffic, that strategy has proven bad for business in most cases. Repeal those ordinances and watch business improve. One exception pertains to the somewhat common arrangement where arterial streets or highways were divided into two one-way streets a block or more apart. In that case, rather than dealing with state highway departments to repeal the scheme, a more practical tactic would be to help businesses and buildings create and take advantage of a "front door" on both sides of the one-way couplet. 1. Share parking arrangements. Make sure your zoning ordinance does not require an excessive amount of parking in a commercial district. Often ordinances borrow old parking standards, aimed at free-standing businesses, from other jurisdictions. In a district, not every business will needs peak parking at the same time, and requirements for each business can be reduced or even eliminated safely. Allow and even encourage pairs or larger groupings of businesses to create private agreements to share parking; for example, a church, a movie theater, and a boutique do not experience their peak parking needs at the same time. Those shared parking agreements can be a requirement of conditional use permits or other discretionary approvals under the zoning ordinance. 2. Create and enforce employee parking areas. Do not allow employees to take prime customer parking spots. Make sure employees park on the periphery of the district or in out-of-the-way locations where few customers would expect to park. Rely on business owners to enforce this, and be stern with owners when they do not do so. If necessary you can require employee parking stickers or hangers, and then ticket them if they park outside their designated areas. 3. Analyze whether parking locations are appropriate to the need. Often commercial districts find that they have plenty of parking, but the lots are not where today's customers want to be. Perhaps an unused lot can be sold for development, and the proceeds used to purchase a new parking lot. 4. If volume permits, consider a parking garage rather than a surface lot. Obviously the garage is expensive and generally will require municipal help to finance, but it allows a compact, dense commercial district revitalization that will be lively and interesting for pedestrians. Lastly, make sure that sidewalks in front of businesses should be very well-maintained, which is an ongoing challenge in areas where large tree roots are pushing upward. Also consider comfortable sidewalk width. Take a walk through your commercial district revitalization area, and imagine how a mom and a grandma pushing a baby stroller are going to fare. Then make a plan to remedy any problems that you see. Do everything you can to eliminate those trip hazard situations where successive street overlay projects have left an older sidewalk in place part-way between the current sidewalk and the current street. Also if your topography is such that you have steps within sidewalks or at corners, provide ramps for some or all pedestrians. Your parking lots also must offer a safe and attractive walkway through them, so that pedestrians feel comfortable walking a short distance to reach the particular business they wish to visit. Ideally the parking lot sidewalk is raised and separated, but if that is impractical, at least make sure walkways are striped. 1. Before you do any new planning, deliberate about the district's size. If your area contains a massive amount of vacant or underutilized space, commercial district revitalization will require major public investments and years of effort and frustration, with uncertain results. Before you begin a new regeneration initiative, inventory filled versus vacant space, with a third category of large users of space that could be located outside of the business district (such as warehouses). If there is way too much space considering your current market conditions, population, and economic base, consider how you can target part of your district for redevelopment as a housing, entertainment, or hospitality district. On the other hand, if your district is so successful that most spaces are filled quickly if they become vacant, and rents are rising, look at whether there is a practical way to expand the boundaries of the district. Either change in size of your commercial district requires a major planning effort, but will pay off in the long run. 2. Encourage joint promotion, marketing, advertising, and special events in every possible way. Keeping your district in the forefront of customer minds is critical. Businesses can take turns being featured in ads, social media, or events. Any visit to the district represents a potential customer acquisition for the other businesses, so experiment with district-wide promotion until it becomes successful. If strong businesses now have robust advertising or social media programs, plead with them to start incorporating commercial district revitalization messages.